The 11pc Woodland Animals baby bedding collection by Sweet Jojo Designs will create a fresh and trendy look for your nursery. This modern designer boy crib bedding set uses a sensational collection of exclusive brushed microfiber fabrics. It combines a woodland forest animal print, a coordinating wood grain print, and solid grey. 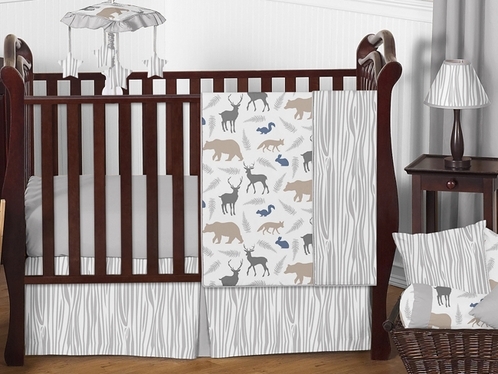 The crisp color palette of grey, white, blue and taupe will set your nursery up in high style. This Sweet Jojo Designs set will fit all standard cribs and toddler beds and is machine washable for easy care and repeated use. The blanket is designed using an exclusive woodland forest animal print. It reverses to a trendy wood grain print. The grey coordinating crib sheet is brushed microfiber for ease, comfort, and repeated use. This set comes with (2) rod pocket window valances. These valances are made with the stunning woodland forest animal print. The pleated skirt uses the wood grain print with a solid grey inner pleat. Complete your child's room with this 3pc plush wall hanging set. This decorative bolster pillow has the woodland animal print with grey trim. What a charming finish to this adorable set!